Explore the Americas with the power of a fully loaded V8, 4×4 with all the comforts of home everywhere you go. Imagine camping anywhere and everywhere with a queen sized bed, heating, air conditioning and a large refrigerator always at your disposal! Not just a vehicle, you will be equipped with every necessity. The package is tested and expedition ready. You just fly into Buenos Aries with your clothes and embark on the adventure of a lifetime. Toyota’s legendary 4.7L i-Force V8 Engine Equipped with Toyota Direct Ignition and sequential fuel injection provides more than enough power to overtake buses in the passing lane even at 4000m. In addition to its capacity for hard work, the Tundra i-Force V8 rewards the driver and occupants with quick response and super-low NVH (noise, vibration and harshness) characteristics. Power-assisted front-ventilated disc brakes with four-piston calipers and rear drums. A four-wheel anti-lock brake system (ABS) is standard on all models. 4WD: A Touch Select system uses convenient dash-mounted buttons to switch between two-wheel drive, four-wheel drive “high” and four-wheel drive “low” modes. New for the 2003 model, a spacious center console offers ample in-cab storage with four cup holders, dual map pockets and hidden storage compartments. 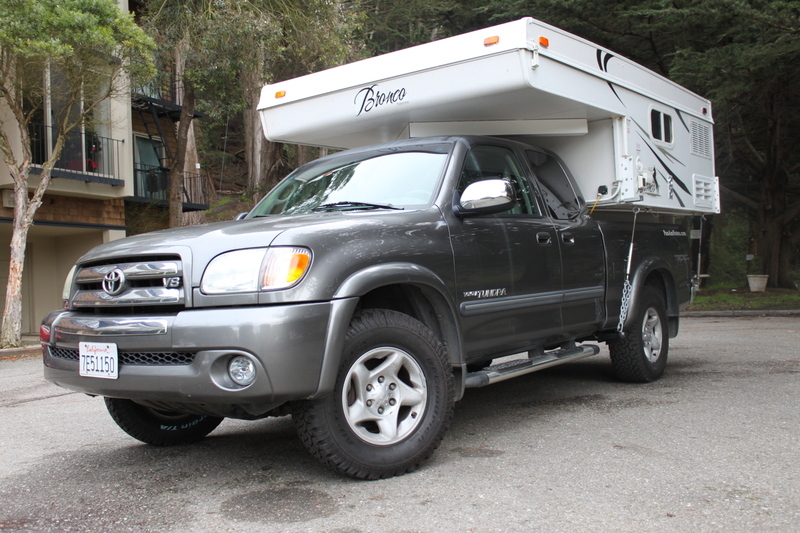 The selection of the 2003 Tundra SR5 trim complete with the TRD Off-Road Package, and Heavy Duty Tow Package was extensively researched and is ideally suited for a pop-up truck camper. The Toyota Tundra was introduced into the competitive North American full-sized truck market in the year 2000. In the first three years of production Toyota had production issues and design oversights that were not remedied until the 2003 year model. Click here to read MSN’s report on the known issues on all Tundras by year. Toyota responded in 2003 to the shortcomings and oversights by releasing a fresh look for the Tundra and new upgraded options such as the 7-Pin towing connector, HD tow package and dedicated transmission cooler. Quite simply the 2003 model Tundra is a beefier truck compared with the 2000-2002 production years. Further, the quality assurance issues related to the I-Force V8 engine were corrected for the 2003 model. According to MSN’s reliability rating system the 2003 Tundra receives a 5 out of 5 for overall reliability. TRD (Toyota’s off-road package) includes: Limited slip rear differential (LSD) for increased traction, upgraded progressive rate springs, Bilstein monotube high-pressure gas shocks paired with an off-road tuned suspension, 16 inch aluminum wheels, accessory fog lights, contoured mudguards, and paint matched over-sized fenders. Tow Package Option, which includes: heavy duty 130 amp alternator and supplemental transmission oil cooler. Access Cab: The suicide doors make access to the rear bench seat easy with the availability to seat 5. The rear contains a fold-down center armrest that houses cup holders and a storage compartment can keep objects hidden from sight. When not carrying passengers, the seat cushion folds up to give the Tundra extra cargo space. SR5 grade: Which adds a color-keyed front bumper with chrome accents, chrome rear bumper, ice-cold air conditioning, cruise control, deluxe CD stereo with four speakers, full instrument gauges, and captain’s chair front seats. The above only covers the factory available options on the Tundra. Much has been upgraded from the factory configuration to facilitate the unique purpose of equipping the Tundra with a pop-up camper for the purpose of overland travel. Click here to see the Modifications and Maintenance for the Tundra to prepare it for a life of international overlanding. 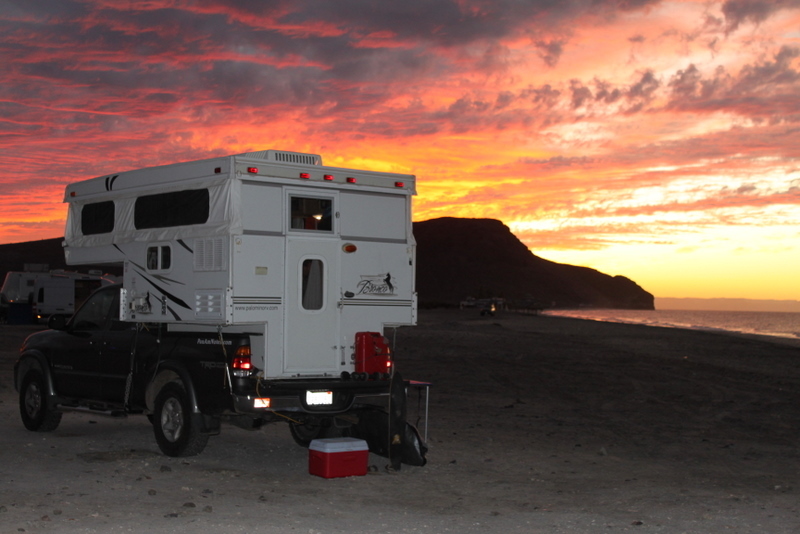 This light weight truck camper is designed to fit a wide range of trucks on the road today. The Bronco sports a low profile for easy on and off road handling and also provides exceptional fuel efficiency. With an easy to operate external lift system and laminated construction of the floor, roof and walls the Bronco is built to last. 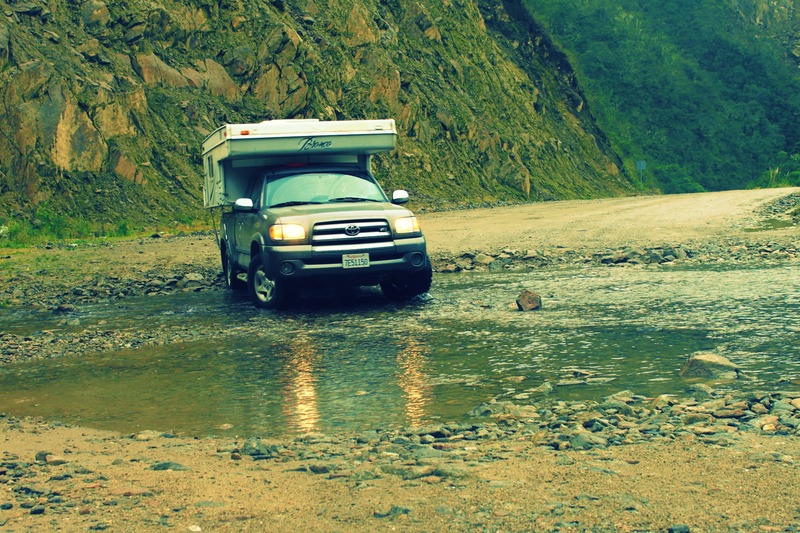 The spacious living quarters are complete with all the features you would find in much larger RV. 20,000 BTU Propane Furnace with adjustable thermostat. Click here to view the factory brochure on a Palomino Bronco. Click here to view more information and pictures of the Palomino Bronco 800. The above only covers the factory options on the Bronco 800. 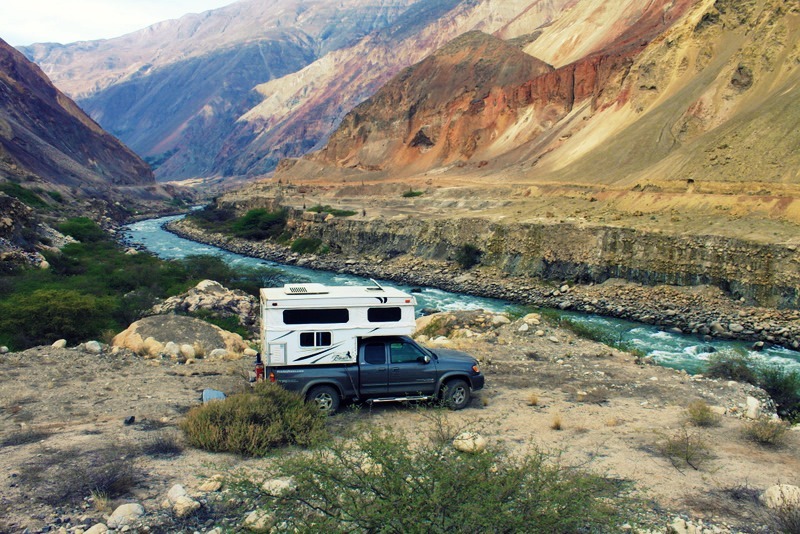 Much has been upgraded from the factory configuration to facilitate the unique purpose a pop-up camper for the purpose of overland travel. Click here to see the Modifications and Maintenance for the Bronco camper to prepare it for a lifetime of international overlanding.